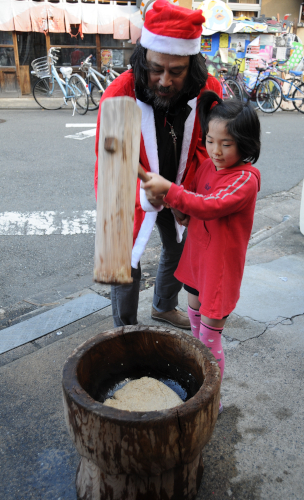 One of the really fun things that happen around New Year is mochitsuki – literally: beating of the mochi – where lots of people pull together and help making mochi. Mochi are ricecakes, made out of a very sticky rice, that is first boiled and then put into a large mortar (usu) and beaten with large wooden hammers (kine). Once the mochi is finished, the individual rice grains have been broken up, and the whole thing takes on a sticky consistency. This large piece of mochi is then broken up and divided among the participants of the mochitsuki to take home or eat rightaway. Yesterday, there was Seijin-no-hi, the national holiday “Coming of Age Day”. And for some reason that I have not quite figured out, the guys at the large construction site in the neighborhood had organised a mochitsuki. They stopped working in the early afternoon to set everything up, and everybody who wanted was invited to come in and help beating the mochi. Of course, adventurous me had to try that! I went there and immediately got a wooden hammer (for lack of a better word) put in my hands. It was surprisingly heavy, which makes sense because it is supposed to do some damage after all. And then, me and one of the guys from the construction company were beating away alternatingly. It was not very difficult and I can see that if you manage to find the right rhythm, you can probably go quite a long time. If you are trained, that is, which I am not… but it was fun nevertheless, and I did get some 10 or 15 beats in – which earned me great respect among the guys. Afterwards, I was invited to soup and mochi, of course. The freshly produced mochi were served with daikon radish and soy sauce, and, as a sweet option that is apparently eaten only during New Year’s, with kinako soy flour, which was surprisingly sweet. And finally, I could take home a whole pack of mochi, which I still have because I have to ask if I could technically put it into soup as well. Anyway, I had fun – and free lunch – and this was the closest I could get to the construction site. By now, they finished the basement and are now on ground floor level, and about a quarter of the building has already the steel beams completed. It will be interesting to see them grow further, if I remember correctly, they want to be finished by the end of the year. This entry was posted in All Things Japanese, matsuri by Iris. Bookmark the permalink. Kinako is really sweet because there’s lots of added sugar!